Discovering you are pregnant is one of the most exciting times in life. 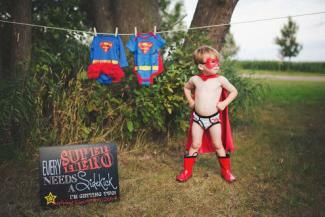 Sharing that news with others can be equally exciting, with creative pregnancy announcement ideas for any scenario. If you have learned you are expecting when your partner is not around, you could take the opportunity to share the news in a fun way. Turn a photo shoot into a surprise announcement. Have professional photos taken or use the self-timer on your camera to capture a picture of you and your partner standing back to back. Hold up a sign saying, "We're having a baby" or a sonogram photo so your partner can't see it. Give your partner a gift, such as a t-shirt that says, "Only the best husbands get promoted to daddy." Wrap the positive pregnancy test in a box and give it to your partner as a gift. To enhance the suspense, put the pregnancy test on the bottom and cover it with tissue paper. Add a note on top saying, "The only thing better than having you as a partner will be our child having you for a daddy." Get creative with desserts by adding funny messages like, "Thanks for knocking me up," or a drawing of sperm with the phrase, "One made it." Sharing the news of a new baby with your partner will be the most special announcement. Finding a way to commemorate such a momentous occasion can make it even more memorable. Slip the news into a normal conversation. When your best friend asks you out for a drink, tell her you can't because you're pregnant. When your mom invites you over for dinner and says she's making chicken, tell her it nauseates you, or the baby doesn't like it as much as you do. Use a t-shirt to share the news at a gathering. You can enjoy waiting to see who notices the shirt first, and who figures out the message. 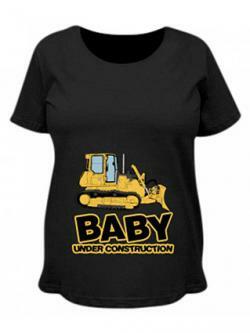 Shirts such as Baby Under Construction are popular, as are those that proclaim "1+1=3." Take a new family photo to give to friends and family in person. Use a chalkboard in the photo to announce your new bundle of joy or hold a sonogram picture in the photo. When you distribute the photo, people will be taken by surprise at the message along with it. During holidays, give gifts that share your special news. Easter eggs filled with pacifiers and a note saying, "Hatching 3/5/16, baby Smith" are cute for Easter. A Valentine's Day poem such as "Roses are Red, Violets are Blue, On January 8th, Baby Johnson is due!" can be attached to any box of candy. Christmas ornaments with phrases like, "Future grandparent 5/7/17" are gifts they will always remember. Create dishes with hidden messages using sharpie markers. When a family member or friend finishes their coffee or dinner, the empty dish could say something like, "Uncle Joe, Est. 2016." Slip a photo of a positive test in with other photographs people are perusing. Serve a baby-themed meal then ask if anyone caught on to the theme. Foods such as baby carrots, baby back ribs, mini versions of favorite foods, pureed foods, and even serving drinks in a baby bottle could be fun. Many of these ideas can be used for couples expecting a baby on their own or via alternative methods like adoption. You can use these ideas to share your news with people who live far away via phone calls or video chatting. Telling co-workers you are expecting a baby can be a bit nerve-wracking in many professions. While creative pregnancy announcements can still be used, you may want to consider telling your boss first and in person before sharing with everyone else. The people you work with are going to see you everyday, so sharing your news can help them understand why you run to the bathroom every five minutes or forget things on a regular basis. Send out an office email with creative wording like, "Dear Team, The newest member of (Company Name) is currently being trained. We expect the little one to start on (due date), provided his or her mommy (your name) gives permission. Please bear with us during this transition, as there may be many trips to the bathroom, as well as several absences. We hope you'll help us in welcoming the newest member of the (your last name) family to the team." Buy a box of donuts or other unhealthy snack to set up in the break room. On the inside of the box write, "Eat up everyone. My mommy can't be the only one with a belly! From baby Smith." Wear a funny maternity shirt that shows a baby in your belly area like the ones found at Cafe Press. Keep a jar of Prego pasta sauce on your desk and wait for co-workers to ask why it's there. Incorporate a photo of your sonogram into a slide show presentation or handout. Twitter, Instagram, and Facebook are popular social media outlets that make it easy for expecting parents to share their exciting news with everyone they know. There is no limit to the creativity you can use when sharing a pregnancy on social media. Out of respect for close family members and friends, it may be nice to share the news with them before posting on social media. From DIY to professional photography, there are tons of ways to announce a pregnancy through pictures. Take a photo of mom and dad's shoes next to a pair of baby shoes. Incorporate something your family really loves to make this photo unique. Runners might use sneakers, hunters could use boots, and people who love the beach might opt for flip flops. Add baby's due date as a caption or incorporate it into the surroundings of the photo setting. Utilize everyday favorite items to show two big and one small as a pregnancy announcement. For example, you could pose two coffee cups with a bottle full of milk between them. Have mom-to-be stand next to the oven while it is open with a bun resting inside. Set the timer to baby's due date for an extra personal touch. Pose next to a street sign that says, "Bump Ahead." Have one parent blow up a balloon that says, "Expecting to Pop" next to other parent blowing up a balloon with the due date on it. 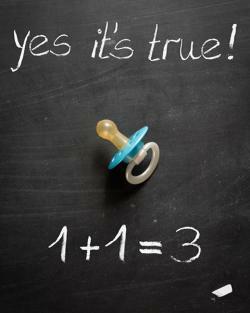 Take a family photo captioned with a numerical phrase such as "1 +1=3," or "And then there were four." With today's technology innovations, anyone can make their own mini movie. Whether you have a YouTube channel or are sharing on Facebook, pregnancy announcement videos can really showcase your creative side. Shoot a music video for part of a song that includes lyrics like "baby." Create a slide show of photos of you from important times in your relationship, ending with the announcement. Capture one partner's real time reaction to hearing the news. Create a fake movie trailer for a title like Knocked Up using images from the movie Up. Creating a movie poster to announce your pregnancy is fun and creative while giving you something to keep forever. Make a play on popular movie titles like 28 Days Late instead of 28 Days Later. Include a tag line such as, "It's the last one...we promise...maybe." Add the due date with the phrase, "Coming to a family near you October 2016." Highlight your names at the top of the poster like real movie posters do for actors. Spoofing songs for pregnancy announcements is another fun and creative way to share your exciting news. Rhyming poems can also catch unsuspecting friends and family off guard. Take a photo with the husband holding two bags of ice and the wife holding her belly as a play on the song Ice Ice Baby by Vanilla Ice. Use a classic children's song to announce your arrival. For example, "John and Jenny sitting in a tree K I S S I N G. First comes love, then comes marriage, now comes our baby in a baby carriage!" Record a personalized song or poem in a recordable greeting card and give to friends or family. Having your pet make the announcement is another unique and fun way to spread the word. Many people consider their pets to be a part of the family, so these can be similar to how a child could announce a sibling. These photo ideas are great for sharing on social media. Have your dog wear a little shirt or bandana that says, "Baby's Guard Dog" or similar phrase. Share a photo of your pet appearing to read a baby book, book of baby names, or parenting book. Take a photo of your pet with a sign saying, "Mommy and Daddy are getting me a human." Utilizing the weather, popular foods, and holidays to announce your pregnancy during any season can add extra excitement to the happy news. You could choose to incorporate seasonal trends from the current time or the time of the due date. Announcing your pregnancy during the winter months gives you theme options such as snow, cold, Christmas, New Year's Day, and Valentine's Day. Take a photo of the mom-to-be with a ribbon tied around her belly and a gift tag saying, "Do not open until April 2016." Send out Christmas cards to close family and friends with your announcement. A picture of two big stockings and one small one with the phrase, "We've Been Naughty" at the top and a due date at the bottom is one great idea. "Santa isn't the only one coming to town," is another fun one. Give gifts that announce the pregnancy like a personalized mug. Pregnancy announcements made in the spring can incorporate April showers, May flowers, St. Patrick's Day, or even Easter. Use a white crayon to write, "We're expecting" on an egg. Give the egg to the other person so when they dip it in the dye, the message will be revealed. Serve some Lucky Charms cereal with a message on the napkin saying, "We found our lucky charm somewhere over the rainbow," followed by the due date. Summer pregnancy announcements can include beaches, insects like bees or ladybugs, and Independence Day. Use chalk to write your message on your driveway. Take a photo on the beach with the announcement written in the sand. Hand out sparklers with an attached note that reads, "We're excited to say our own little firecracker is on the way!" Sharing your pregnancy news in the fall opens up creative announcements related to leaves, turkeys, pumpkins, Halloween, and Thanksgiving. Carve a large pumpkin representing dad and one representing mom. Cut mom's open and place a baby pumpkin inside. Wear a Thanksgiving-themed shirt like one that says, "Eating for two." Make a creative Halloween costume with dad as a doctor and mom as an x-ray showing a baby in her belly. 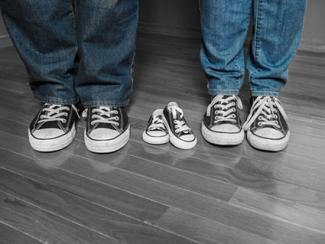 The best way to make a pregnancy announcement for a second child is through your first. If your child cannot talk yet, buy him/her a shirt that says, "I'm the Big Sister!" or "I'm the Big Brother!" and see how long it takes everyone to notice the words. If your child can talk, have him/her tell everyone a big secret. Tell your child to go around individually to everyone and whisper it in their ear. Not only is this a fun way to tell family and friends, but a good way to get your firstborn involved and excited about the new baby. Share a photo of your child announcing the new baby in a funny way. One idea is to take a picture of your child in a crib with an eviction notice taped to it. Another is a photo of your child wearing a superhero costume with the caption, "Every superhero needs a sidekick," and baby's due date. Telling family and friends about your upcoming baby is a joyous occasion. You and your partner should discuss when you feel comfortable telling everyone the news. The most often recommended waiting period for announcing is after the first trimester because the risk of miscarriage is lower. When you tell family members, friends, or co-workers depends on your situation and personal preferences. Sharing news of a pregnancy is exciting for the expecting parents as well as the unsuspecting family and friends in their life. A little creativity along with your happy news is sure to bring a smile to anyone's face.